The Coastal Wetlands Planning, Protection and Restoration Act, (CWPPRA, pronounced kwǐp-rŭh), is federal legislation enacted in 1990 that is designed to identify, prepare, and fund construction of coastal wetlands restoration projects. Since its inception, 210 projects have been authorized, benefiting approximately 100,000 acres in Louisiana. The legislation (Public Law 101-646, Title III CWPPRA) was approved by the U.S. Congress and signed into law by former President George H. W. Bush. Since its inception, 210 coastal restoration or protection projects have been authorized, benefiting approximately 100,000 acres in Louisiana. To view the list of projects and learn more about individual projects visit our project page. Louisiana wetlands are unique and vital ecological assets worth saving. Wetlands act as a storm buffer against hurricanes and storms. They act as flood control devices: holding excess floodwaters during high rainfall (much like a sponge). Wetlands replenish aquifers, and they purify water by filtering out pollutants and absorbing nutrients. CWPPRA funds have been instrumental in helping to restore Louisiana’s vanishing wetlands. 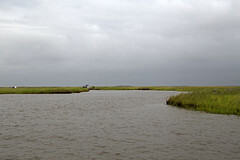 Approximately 40 percent of the coastal wetlands of the lower forty-eight states are located in Louisiana. Unfortunately, this fragile environment is disappearing at an alarming rate. Louisiana has lost up to 40 square miles of marsh per year for several decades – that’s 80 percent of the nation’s annual coastal wetland loss. To date, Louisiana has already lost coastal land area equal to the size of the state of Delaware. This loss is at an average rate of an acre every 38 minutes. If the current rate of loss is not slowed by the year 2040, an additional 800,000 acres of wetlands will disappear, and the Louisiana shoreline will advance inland as much as 33 miles in some areas. Wetlands also provide habitat for a variety of wildlife. Coastal Louisiana lands are the breeding grounds and nurseries for thousands of species of aquatic life, land animals, and birds of all kinds – including our national symbol, the bald eagle. This ecosystem also provides a migratory habitat for over five million waterfowl each year. People also benefit from Louisiana’s coastal lands. Louisiana is responsible for a major part of our nation’s oil and gas production, shipping commerce, fisheries industry, fur harvesting, and oyster production, accounting for over 55,000 jobs and billions of dollars in revenues. Additionally, wetlands are wonderful recreational resources and are part of Louisiana’s growing ecotourism business. To learn more about the economic value of our wetlands, read “The Cost of Doing Nothing” in WaterMarks (Summer 1999). Although current funding levels do not support all of the necessary restoration required for a sustainable ecosystem, CWPPRA continues to address immediate restoration needs while establishing a foundation of strong science, public participation, and agency cooperation that will continue to serve as the cornerstone of future programs.